O Canastro Gallego, Puerto Chico, San Agustin, Gran Canaria. Tel: 928 774274. Excelente! Staff a bit frosty at first, but after a few visits they are charming. This is a real local restaurant; there always seems to be one table of visitors amid a hearty scrum of locals. As the name suggests – Gallego means from Galicia, the fish-friendly corner of north-west Spain – a certain expertise and ease with shellfish and fish is obvious with every dish. Spaghetti with clams has a good and gutsy classic sauce – white wine, parsley and a shake of pepperincino – fuel-injected with lots of natural clam juice from the shellfish. Lovely cigala are split down the middle and tossed on the plancha with a few slivers of garlic. The body meat is good, but the claws are underdone, rendering them watery. At 36 euros for six, you want to enjoy every little bit! Octopus on Spanish territory always seems to have more flavour than the stuff we get at home; here it is prepared in traditional Galician style - boiled, then with the slices of tentacle dusted with paprika. No wooden board, but no complaints either. 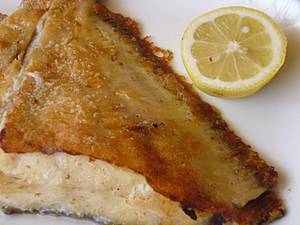 And the turbot is magnificent; a single portion comprises a large piece of fish cleaved in two across the central bone, seared on the plancha and finished off in the oven. This is perfection; the best way to cook this lovely, wild gelatinous fish. As you might expect, the chefs on this island use garlic like maniacs, but even with the turbot it never overwhelms and they know the secret of cooking this robust fish in a robust way. With a green salad, a hunk of crusty bread and a glass of crisp Albarino, this is lunch heaven. Portions are monstrous. Good croquetas with a fluffy fish and potato filling cost 2.5 euros for a plate of about 20. I am not used to such generosity. Some brown crab is nice and fresh, while a whole sea bass (lubina) is a little overcooked. I think the plancha is perhaps too hot for cooking a delicate fish such as this, but the flavour is good. Apart from very good crème caramels, all the puddings are bought in. Lunch for two, 50 euros, excluding drinks and service. 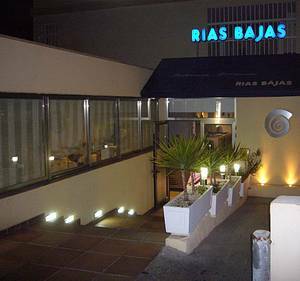 Rias Bajas, Edificio Playa del Sol, Avda de Tirajana, Playa del Ingles, Gran Canaria. Tel: 928 764033. Bravo! Supposedly the best fish restaurant in Playa del Ingles. It is certainly glitzier than the other two reviewed here and looks a little like Rick Stein’s flagship restaurant in Padstow. Perhaps he won’t thank me for that, but he would approve of the sea bass cooked in salt and the customers who taxi here from all over the island for superior fish dishes. The décor is crisp and nautical, with waiters in navy waistcoats and an air of serious intent. There is a weird smoking room, where the smokers are displayed behind glass walls, like the endangered species they undoubtedly are. Meanwhile, there are interesting things to eat, including a tank full of Canadian lobster and a separate tank for the (far tastier) local langosta. Percebes are a type of goose barnacle that grow on cliffs and are an uncommon delicacy, even in Spain. These odd little nubbets, which look like dinosaur toes, have not appealed much before now. However, I like the ones served here – although a 100g portion is plenty enough to sample their flavour. Steamed and served in a folded napkin to keep them warm, they have an intriguing texture slightly tougher than that of a snail, and taste primeval in a deeply briny, whelky way. Prehistoric! (as some restaurant critics might exclaim). Also notable are the almejas de carril; terrific, big, juicy clams that taste of the ocean and here are served raw. Gambas planchas are sweet, but have picked up too much oil from the hotplate. In short, this place is not as overpriced as I had expected and uses some good quality prime ingredients. Lunch for two, 80 euros, excluding drinks and service. Hornos de la Cal, Playa, Arinaga. Tel: why bother? Escandalo! Wherever you travel, there is always one restaurant you regret visiting: where they rip you off with a grunt on their lips and ice in their hearts. In Gran Canaria, Hornos de la Cal is that terrible place. 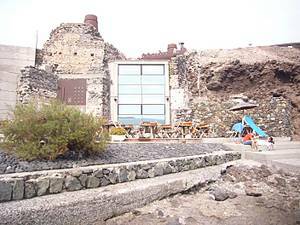 Situated at the end of a long walkway on the beach at the town of Arinaga , it is a modern establishment,carved with great effort from a solid cliff of rock. Should we beware the restaurant with the distinguishing architectural feature? Yes, especially if they have made the interior look like a failing trattoria in an Italian commuter town. The people who work here are strange and unfriendly while the food is, generally, of a very poor quality. Spider crab is appallingly cooked and double the price it is anywhere else. The poor creature is soupy inside and completely inedible. There is one nice dish, a spaghetti and clam preparation made with grilled chips of golden garlic, but this still does not excuse the 19 euro price tag. Sama – a type of gilthead bream – has been scorched on the plancha and served welded to the plate. By accident, not design. All in all, a miserable and expensive experience. Lunch for two: whatever they think they can get away with.